The Red Chicago Bulls logo is reminiscent of the Red Heifer in Parashat Hukkat. 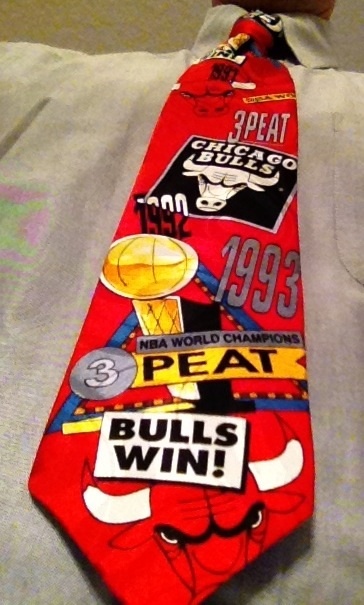 This tie is in honor of the sacrifice of the Red Heifer described in Numbers 19, the beginning of this week’s Parashat Hukkat. One could not enter the precincts of the Tabernacle or Temple in a state of ritual impurity. Only being sprinkled with the ashes of the red heifer would remove defilement from having had contact with the dead. As Professor Jacob Milgrom wrote, the Temple is a place to affirm life. Associations with death are not welcome. Of course, a bull is male and a heifer is female, but why get hung up on small details? Shabbat Shalom.